Facing constraints is nothing new to non-profit organizations. From tight budgets to strategizing growth, managing the books can all too quickly become overwhelming. Intuitively, we know using robust tools will simplify many kinds of budgeting and reporting processes. Yet, outside of easing the day-to-day workload, what else can corporate performance management (CPM) software do? Namely, save money. This article will describe various ways, ranging from essential to innovative, certain CPM-generated dashboards and reports can control a non-profit organization’s costs. In general, dashboards can display whether or not your non-profit organization is meeting its benchmarks, and how its performance compares to other non-profit organizations and custom insights specific to your organization’s goals. The advantages of clearly seeing your organization’s overall health, with readily accessible and reliably accurate data at a glance, enables fast, strategic decision-making. Let’s discuss non-profit-specific examples. As stated above, having a clear picture of how your organization is meeting its benchmarks can have a significant impact on operational strategy. 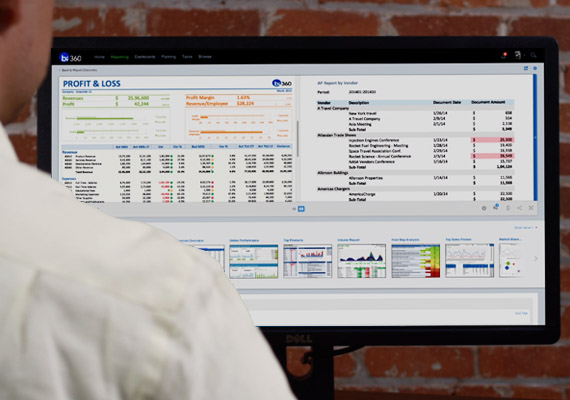 A “benchmarking” dashboard compares key financials, such as revenue growth, gross margin or surplus/deficit margin, to other organizations and industry averages. Perhaps your organization has performed as expected according to internal standards, but when compared to other organizations, reveals a much different picture. Maybe your organization already has a benchmark mechanism in place, but compiling all of your data into one place is a manual process that doesn’t happen consistently or reliably. In this case, a benchmark dashboard generated from a “data warehouse” ensures accurate numbers, saving the time and cost preparing the data would otherwise accrue. Similar to benchmark dashboards, “Executive” dashboards provide a big picture that shows the major metrics: actual versus budgeted revenues, expenses, surplus/deficit, membership statistic and grant metrics into a single, visual field. Getting more in depth within the major metrics, dashboards specifically for revenue can rank the top sources of revenue, like membership dues and grants, show 12-month trends of the sources of revenue and drill down to specific programs or regions. In particular, a dashboard dedicated to information about grants easily shows which programs generate the most revenue or cost the most, or display a pipeline of grant requests that can be drilled down by staff member. We can see how a series of dashboards summarizing the major metrics that measure the health of a non-profit organization provide decision-making information. How does this in itself save money and minimize operational overhead? Nearly as important as the information itself, it is how easy (or difficult) it is to generate. The ease, reliability and accuracy a CPM tool provides, means time and energy can be spent strategizing growth based off the numbers provided, as opposed to determining the numbers. While dashboards provide useful summaries, equally key to saving money in operations for non-profits, are detailed, custom reports. Based on the positive trends or red flags found in the dashboards, organizations will require a detailed breakdown of what makes up the big-picture. Overview reports, for grants or memberships for example, automatically generate detailed information like grants by granted, encumbered amount and balance, or various membership statistics, etc. A key feature of overview reports, especially for grants, is the ability to click on specific programs and drill down into underlying grants. However, much like with the dashboard examples described above, the ease of generating these reports, is nearly as important as what the reports say. For non-profit managers, a “Statement of Activity” report with “Auto Narrative” generates a report, such as an operations report, and then automatically generates an additional “narrative” page that describes key results from the in-depth operations report. These types of reports become the bread and butter of monthly performance reviews. Investing in a flexible CPM tool means you can reliably pull these reports on a consistent basis, allowing organizations to stay on track with goals. Other reports useful for non-profit organizations, like the statement of financial position report, clearly show the financial position by current or prior month. Detailed Accounts Receivable and Payable reports respectively show data per member or vendor, with clickable rows that display each invoice or payment. Of course, a reporting tool should be able to generate cash flow statements and other financial reports readily. A CPM tool that can support custom reports can also make a huge difference in operations. For non-profit organizations, custom forms can display, for example, long-term strategy planning in funding by showing actual cost, forecast cost and strategy targets year by year. Overall, a flexible, robust CPM tool can provide non-profit organizations informative dashboards and reports that themselves can help drive strategy. From key insights like which grants consistently generate the most revenue or which staff member makes the most grant requests, to the time saved on generating reports that require multiple data resources, a CPM tool can significantly reduce overhead. If you are struggling to find a tool that checks all of these boxes, or aren’t sure how to work with the tools you already have, Solver has a team of experienced professionals that can get your organization started in upgrading your reporting process. This entry was posted in Uncategorized and tagged Benchmark Dashboard, BI dashboards, BI360 Data Warehouse, cloud cpm, Cloud Financial Reporting, CPM, CPM Software, CPM Solutions, Dashboards, drill down reports, financial reporting, non-profit, operational reporting, reporting by Sofia Iatarola. Bookmark the permalink.